As is often the case, having written the title for this blog posting, I don't really know where it's going to go from there, but here goes. I came across some very interesting information about the Vagus nerve that seems to have inspired me to follow this thread a bit. It seems that from both a science perspective and a spiritual perspective, people are examining the Vagus nerve and it's affect on our bodies these days. When both "sides" are looking at the same thing, that always intrigues me. Must mean there is something to be gained from the intersection of that research. This nerve is part of the parasympathetic nervous system which means it's about slowing things down. It is in direct contrast to "fight or flight". When the parasympathetic system is "in control" we are in fact "in control". We are calmer, able to think clearer, and experience less fear. Since these responses travel throughout the whole length of that nerve, that means we are calmer throughout all of the 7 chakras. That seems like a good thing! Apparently science has also discovered that the Vagus nerve is stimulated when we feel empathy. When we connect with someone else's emotions and feel for them, even if it's through watching them on television or seeing a picture, that connection stimulates the Vagus nerve. We often feel that connection in our heart- the 4th Chakra. Sometimes we feel that lump in our throat- the 6th Chakra. Sometimes we feel something in our Root Chakra, particularly if we connect on a fear level for that other person. Sometimes we get a rush to the solar plexus, the 3rd charka. It's actually not the fight or flight feeling, it's the parasympathetic Vagus nerve giving us a jolt and reminding us that we are connected in some way to the plight of others. The Vagus nerve it would seem taps into other people's energy. People that are highly sensitive to others, to energy sources, and their intuition, have highly toned, readily functioning Vagus nerves. Science confirms that the Vagus nerve is attached to emotions, the right side of our brain, more than thoughts, that logical left side of our brain. 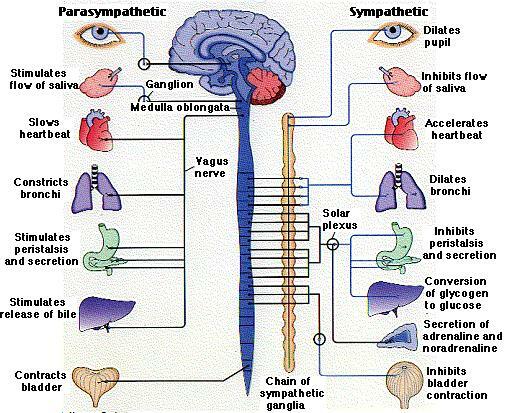 The Vagus nerve participates in controlling our moods. Medical science has found ways to stimulate the Vagus nerve. There are methods used in the pre-hospital field to stimulate the Vagus nerve for the purpose of slowing down a rapid heartbeat. There are also techniques to stimulate the Vagus nerve to reduce clinical depression. Research is underway to find less invasive techniques to do this. Is there a "so what" to be gained from this? Maybe... Perhaps we try to block our Vagus nerve. Maybe in our world of hard-core business, logical thinking, "fight to get to the top", we unconsciously sever our Vagus nerve just a bit, or from time to time. When we give in to the stressful world of the sympathetic nervous system and make decisions based on fear, anxiety and what seems like logical thought, in a fast-paced stressful atmosphere, we override our parasympathetic system. We try very hard to over-ride our emotions because that won't get us ahead. Ahead of what?? Maybe we should work on toning up our Vagus nerve a bit. Maybe we should allow ourselves to feel empathy and emotions, and accept the connection we have with others and with all energy around us. Maybe if we acknowledged that connection and celebrated it's existence we wouldn't be "short-circuiting" throughout that Vagus nerve. If we could allow the energy and impulses to flow in a constant and smooth fashion we might even out our moods, balance our chakras and react from a calmer more relaxed place of emotional stability. I can't wait to hear what you think once you've had time to "process". I was really hoping to generate some thoughts on this so I might be able to get things clearer in my own head! It felt like an area that would really be worth exploring. "I am movie"??? Sounds interesting. Heather, I think this is a very interesting article you wrote. I agree with you. I like the way you think. You definitely brought up something very insightful on your part. It seems that vibrating energy manifests itself physically in this way. This also shows the importance of the 'gut-brain connection'. Keep it up. "The sympathetic system has its center in a ganglionic mass at the back of the stomach known as the solar plexus and is the channel of that mental action which unconsciously supports the vital function of the body. The connection between the two systems is made by the VAGUS NERVE which passes out of the cerebral region as a portion of the voluntary system to the thorax, sending out branches to the heart and lungs, and finally passing through the diaphragm, it loses its outer coating and becomes identified with the nerves of the sympathetic system, so forming a connecting link between the two and making man PHYSICALLY A SINGLE ENTITY." In my opinion, through personal experience, we achieve this through UNCONDITIONAL LOVE. As easy as it may sound, it is true. Not like you have to be someone or something else, because I have seen, "life is an unfoldment, not accretion". It is to simply be. Understanding that yes, negative forces do exist and they will never leave unless you just "go with the flow. Accepting the "good" and "bad" as one. If you can see this, you will realize that there is no "good" or "bad" but wise and unwise decisions. It's all in you. As we have been taught so different in our lives, we are unable to see that this is what GOD is and does. God is...because I AM. Unconditional love for ones desire and self is key to succeeding and attracting your desires. No such things as goals. Just BE. MY LIFE changes everyday. I love it. My "gut instinct" is so much fun to follow because I know that even if it is "fear" it feels like, ultimately it is an excitement, which in turn is something we should follow because nothing is here to hurt us. Notice is you face your fears, life becomes easier by the second. Don't be afraid to take the "leap of faith" or jump for what awaits you on the other side is a better more complete you. Suicide, "voluntary death" or "killing yourself" as people call it, is the ultimate leap of faith every deceased being takes in order to feel alive again. It is, in essence, ALWAYS peaceful. We are Spirits and we are the strongest, most perfect being GOD has created, WE NEVER DIE. We learn this through our mistakes or imperfections. Following your gut feeling IS following your heart. Life is more fun that way. 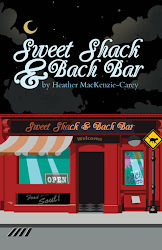 Dear Heather, The Vagus nerve connects to those vital organs that respond to the signals from the amygdala, that almond shaped gland in the mid brain, depending on the type of signal either of fear or of anger. However, the missing element in your explanation is the time factor. The signal strength changes with time. The faster it changes, greater is the response. If the signal is changing pretty slowly the Vagus nerve signals are superseded by the normal nervous system signals. The Vagus nerve signals are generally instinctive in the sense that action happens even before the individual can assimilate what is happening. What you suggest may be the reverse action when the signals are calming down back to a steady zero state. Of course this is the interesting and more productive part to check out. Let us hear the findings of your investigative probing. There is always something new to amuse ourselves. Hmm.. interesting.. especially since the meaning of "time" seems to be changing so much lately- sort of inconsistent in nature or something hard to define. Also some aspects of balance in there that could use some reflection. I guess the ultimate would be have reaction and feeling lined up at the same time- which just might be "living in the now"? What is also interesting to me is the amount of dialogue this post has, and continues to generate. It must be "touching a nerve"!!! I love the interaction. So thanks everyone for continuing the discussion! I specifically attuned myself to the incoming Venusian transit energies, since i understand that i have the opportunity now to set intentions for the next 104 years till the next one. so bringing in the physiological changes that come with this and of course effortlessness. after i read this blog about the vagus, i can see that it has been an already active part of my way of tuning into my reality that i've been using for quite some time. i slowed my heart rate down when i had my awakening experience with a great white shark in 1999 off the mozambiquian coast. I also tune into other people's frequencies quite easily, as well as feel empathetic resonance with my environment and nature etc, now i see that it is this that i use as my tuning fork… SO seeing how its already been functioning in quite a pivotal way in my life, I'm very eager and welcoming of the next level of experience. Wow! Sounds like quite a journey- can't wait to hear your next update! A woodpecker was just "drumming" to my guitar playing in the woods, I came home clicked on the picture that resembled the bird I saw. 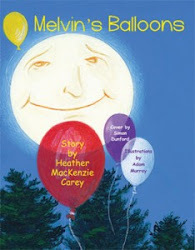 Now im reading this... Neat! I'm still smiling over the picture I have in my mind of "Mushroom Man" playing guitar accompanied by a Woodpecker! You must be playing the right tune I figure- way to go! Kenton, I found the post, but wonder if I can get the information in print, rather than sound. Hi, I don't really have a point to make, just adding to the conversation. My lovely 13 year old daughter just had a vagus nerve stimulator surgically implanted to control seizures. She has a rare syndrome which manifests in developmental delay, cerebral palsy, low muscle tone, limited mobility, underdeveloped mouth and throat musculature, hyper salivation, and has intractable epilepsy (~60 seizures a day). It will be interesting to see if her seizures are effected by the implant. The battery in her chest will be calibrated to send periodic impulses to the electrodes on the left vagus nerve in an attempt to regulate brain activity and either reduce the number of seizures, the severity, and/or duration. Your article is so interesting to me because of the chakra connection which I had never considered. I've done a lot chakra work myself so it caught my eye. My daughter is highly empathetic and is the pure expression of unconditional love--she is one of the most balanced people I know. 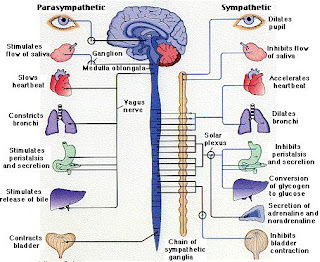 I just think it's very interesting that the vagus nerve plays such a large role in parasympathetic functions. Thanks for posting such an informative article. I enjoyed reading the comments. I had no idea how much "work" was being done on and treatments revolved around the Vagus Nerve until I wrote this post! It's pretty amazing and seems to come from very different angles. I hope it helps your daughter- keep us posted on her progress! Hi, I just was in a car accident where a woman rear-ended our car and then we were pushed into the car in front of us. Ten minutes after I had a rush of energy in my body and my heart started pounding to 130 beats per minute. I was brought to the ER. They said it was an adrenaline rush and sent me home. Everyday after that I had faster than usual heart beats and upset stomach. I called an ambulance one night because I was so scared, they said the same thing with adrenaline and that I was stressed out since my heart sounded quite good. Then I contacted my friend who does cranial sacral work. He tuned into my ailments and said my Vagus Nerve was pinched in the accident. After two sessions it is finally gone and I have a regular heart beat. I hope one day medical doctors recognize this aspect of the body as fully integral and important. Thank you. I am so pleased to come across this post. This is my personal testimony to the wonders that the vegas nerve has given me. I stumbled on the vegas experience while practicing my personal , spiritual ritual. Alchemical crucible which includes grounding and intention. but my hand and eyes. I use water as a sacrament . Toning , I hold the water in my upturned mouth. Coupled with the tightening of my talilbone and pushing down on my diaphram. The water dances in my throat , with each breath taking the experience deeper and stronger.. Finally a powerful peristolic spasm. My entire being stimulated and mobilized. An amazing shift of consciousness. I dance and pray and spazzed in rythym . Tapped into this powerful wave , I alighned my physical with the spiritual . Giving thanks to the earth ,Praising the sky. Jumpstarting this appreciation for all creation. As my custom I continue my experiment in a nearby tunnel . Followed by , you guessed it funky trombone. This I offer to you in the hopes that you may find use . This defines my every morning. stimulation of the vagas system and powers of yogis and pranayama. the power of the vegas nerve. Warming up on my t-bone usually takes about 15 minutes. With this practice I can skip that warm up and go right to full on blowing. I had done 50 push ups while my back was wonderfully loose. I give thanks that I have finally a place to share. P.S. I have a pluto mars conjunction in the first house. Thanks for sharing that personal experience! I think it's when we share "stuff like that" that we can actually grow and accept and ease our ways into what otherwise might be uncharted territory and the "unknown". Your story kind of leaves me "speechless" without words but perhaps that's because my vagus nerve is allowing me to feel not think and analysis!! Enjoy the journey!